LONDON--(BUSINESS WIRE)--According to the latest market research report released by Technavio, the global fintech software market is expected to accelerate at a CAGR of over 7% during the forecast period. Influence of digitization is one of the key factors triggering the growth of the market. This research report titled ‘Global Fintech Software Market 2018-2022’ provides an in-depth analysis of the market in terms of revenue and emerging market trends. It also includes an up-to-date analysis and forecasts for various market segments and all geographical regions. In 2017, the banking segment accounted for 49% of the global market and is projected to reach 50% by 2022, exhibiting almost 1% increase in market share. Rising demand for data integration and visual analytics is an emerging trend in the ICT space. Increasing data proliferation and complexity have made the process of deploying and maintaining reliable data interfaces more difficult. Enterprises are adopting data integration solutions to overcome such instances. FinTech software offers on-demand accessibility for real-time synthesis of data, thereby ensuring real-time analysis for effective decision-making process. It enables enterprises to monitor, transform, and deliver data; understand business processes; and bridge the gap between businesses and IT. It also helps enterprises integrate technical and business processes from different sources and convert them into meaningful and valuable information. With the exponential increase in data volume, the need for analyzing, transforming, monitoring, and interpreting data has become a priority to facilitate different financial organizations. Moreover, enterprises are also integrating business analytics software with visual analytics tools for the dynamic representation of data. Visual analytics features in FinTech software are used to highlight key points and metrics through several types of graphical reorientations. 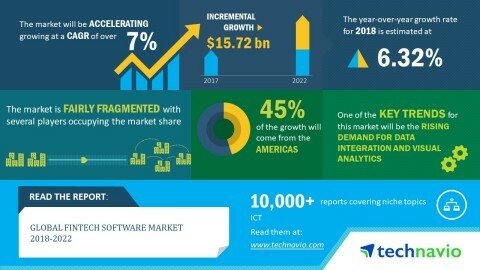 The global fintech software market is expected to accelerate at a CAGR of over 7% during 2018-2022, according to Technavio.